With great holiday promotions come great responsibility. The duties that follow include fielding a ton of questions, making gift recommendations and most importantly, finding a way to deliver those gifts in a timely manner. There are plenty of ways to interact with consumers throughout the holiday shopping process, but social is quickly taking the lead. Our data suggests that the number of social messages retailers receive during the holiday season has been trending upward since 2015—with the average retailer receiving approximately 30% more messages than the previous year. For brands gearing up for the holiday madness, preparation is key—not only to provide compelling offers and promotions, but by ensuring that the right pieces are in place to efficiently serve customers and meet their demands. Luckily Sprout’s Bot Builder has made several enhancements that could help surface new business opportunities and make responding to social messages throughout the holiday season more manageable. Throughout the holidays, marketers must shift focus to tell stories around gift-giving. In many cases, that could mean reaching an entirely new audience. How can you update your social strategy to serve this need and still drive engagement? An online retailer receiving a high volume of messages on Twitter and Facebook can leverage automated workflows to build out interactive quizzes and make personalized gift recommendations based on user inputs. Now, Sprout’s Bot Builder makes it possible to create, deploy and manage chatbots that can handle a series of interactions. 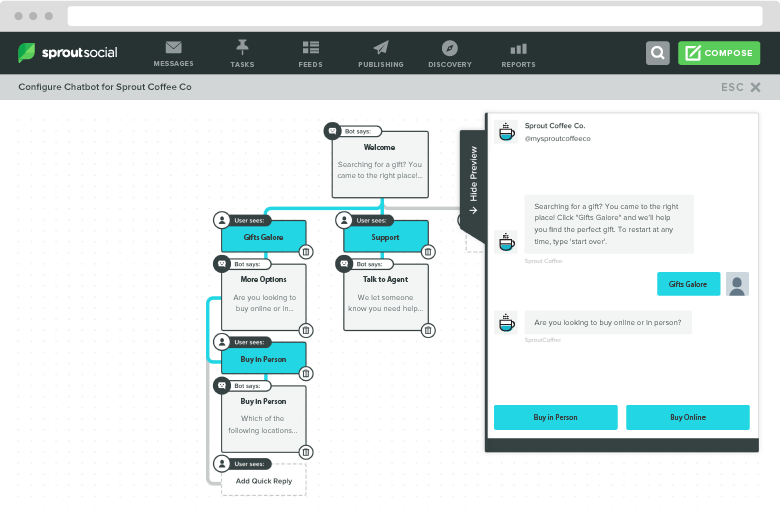 Using the Conversation Map, you can easily visualize your conversation and introduce another level of Quick Replies and Auto-Responses that guide users down specified, interactive paths depending on which buttons they engage with. Ask questions like “who is this gift for?” and “what are his or her interests?” to lead users to relevant gift ideas. By offloading a greater portion of the conversation to the bot, your customer service agents can offer more sophisticated and personalized marketing experiences at scale throughout the holiday season. To reinforce gift ideas, seamlessly add images or animated GIFs to your chatbot conversation. You can choose to add them between Welcome Messages and Auto-Responses to bring more personality to the interaction or use it as a way to showcase your products. For example: Using chatbots on Twitter Direct Message or Facebook Messenger, a toy store can share images of popular toys to help children create their wish list as they engage with different Quick Replies. They can also use Carousel Cards in Facebook Messenger to display multiple images within one response, making it even easier for children to explore more options and find the right toy. From there, they can encourage them to share the lists with family and friends. Depending on your audience, images can also be a fun way to spread holiday cheer and use familiar holiday characters to drive engagement. 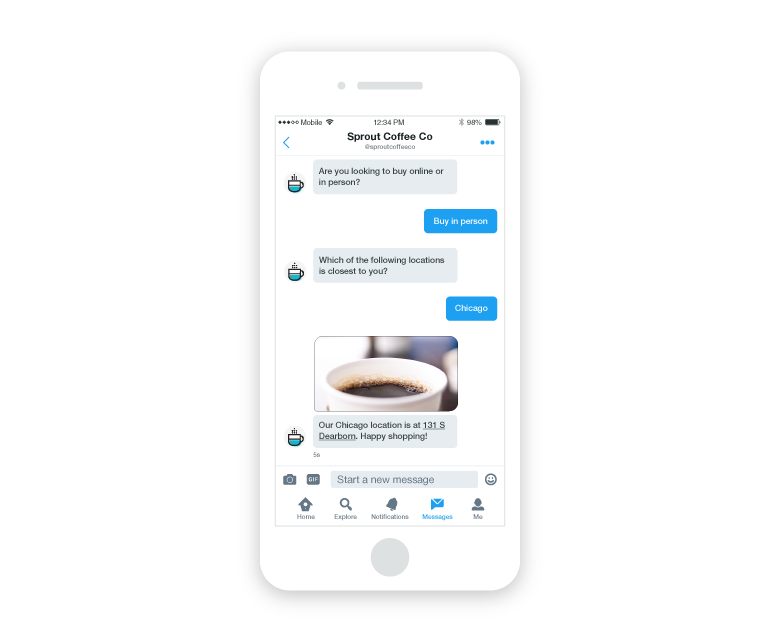 The chatbot interaction culminates with the call-to-action – once a user has responded to all of your questions and is ready to move forward. Your call-to-action is a button you can add to your chatbot conversation to drive users to a specific goal. Use call-to-action buttons to lead consumers to a specific product category or page on your website, to share their experience with a friend on social or directly to the checkout page. 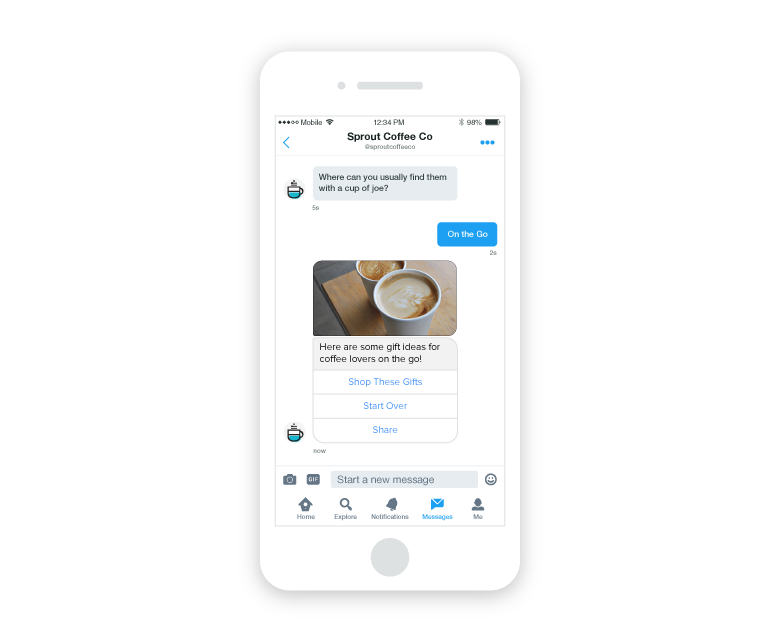 Your bot can be your most valuable conversion tool by helping you guide users to their final destination. Think carefully about where you want your customers to land because this interaction with your brand could lead to high-value conversions at scale, without any manual sales assistance. All of these tools can be used separately to support your holiday needs, but used together they have the potential to have massive impact on your bottom line by proving and delivering social ROI. If you need more guidance on creating chatbots, read our Facebook and Twitter chatbot announcements. If you’re already a Sprout user on an Advanced plan, simply log in to build your holiday bot now.